I didn't really know a whole lot about The Thaw before watching it. Before someone mentioned something about bugs and making you feel itchy- I really just thought it was about some evil monster who was thawed and then went on a mass killing spree sort of reminiscent of The Thing. As it turns out- The Thaw is primarily concerned with global warming and the effects and possible future outcome if things do not get better. If you are like me however and find that you look exactly like Martha MacIsaac, then instead of being concerned about the effects of global warming you are more likely cringing and hoping that your voice doesn't sound as whiny- and praying that her teats never get revealed for the world to see. Did I miss the main point of the film because of this? Probably. But to be honest I didn't love it enough to really care- so there! 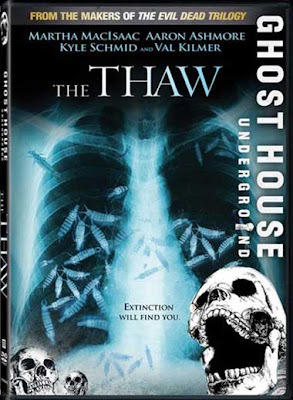 The Thaw is about a scientist and his team who uncover a thawing Woolly Mammoth in the ice- only to discover that it harbors a deadly parasite. When 3 students and Val Kilmer's daughter are sent to the field to partake in the studies- they find that something is utterly amiss. There are no scientists, no experiments, no power. There is a dead polar bear however- and just guess what that polar bear has inside of it. The students then must find a way to destroy the parasite before it can stake it's claim on the rest of the world. It's not a bad film by any means- but I just had trouble really getting sucked into it all. 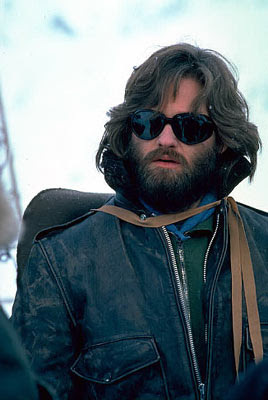 When you take a movie like The Thing- which relies on the suspense and dread of being isolated- and trapped with something that will inevitably claim you for your own- you feel that sense of hopelessness. The Thaw- which relies heavily on that same kind of feeling does not end up delivering the same amount of hopelessness. I was distracted by flaws in the script- and some unclear plot points. Plus I was expecting Val Kilmer to be doing a sad- past his prime, I'm kind of fat and wish I had a beard like Kurt Russell kind of role. Alas- Val Kilmer is pretty much absent for much of the action. Annd he looks like this. Ahem, anyways...sure when the major plot is revealed you are a bit taken aback and sullen, and maybe a little worried about the future of the world--but I mostly just felt like it was rushed and packed into the last 8 minutes or so. The story wasn't built up well enough for the final reveal to be as groundbreaking as it should have been. And who knows maybe it was just me- but something was definitely lacking here. When I try to wrap my head around what Val Kilmer's character was trying to accomplish and why the students were sent there and why he wanted his daughter to come- and all those other shenanigans I can't help but think it's not because I'm not smart enough to digest it- but because something did not connect well enough within the movie. I did really like the idea of global warming causing the essential outbreak of the parasite-but I just felt like the movie could have taken that central idea to better places. The characters were all for the most part annoying and the most of which sadly is my doppelganger; Martha MacIsaac, who has a whiny voice and strange acting skills- that remind me of her whiny voice and equally strange acting skills in Super Bad. Don't even get me started on Fredrico's character- who's own contamination is questionable and unclear- but he's just an annoying and useless kind of character. As for gore- well there is plenty of it- and not the type you would expect either. The arm chopping off scene was brutal- without showing grotesque and horribly done close ups. The bug coming out of the wound in the beginning was Yell Out Loud (YOL- yup start using it) inducing- and the endless shots of poop vomit, and pulsating egg sores are done well enough to make even the toughest movie goer puke in their popcorn. Although not as groundbreaking as I would have expected the movie to be, it does make you think at least a little bit. Sure not that many people find that their daily lives are affected by images of polar bears dying due to melting ice caps--but I'm sure more people would be affected by knowing that some day their skin could be crawling with oodles of bugs. Which reminds me--The Thaw is pretty much an extended version of the last segment of Creepshow. Creepy, crawly, and something you wish you could erase from your mind. 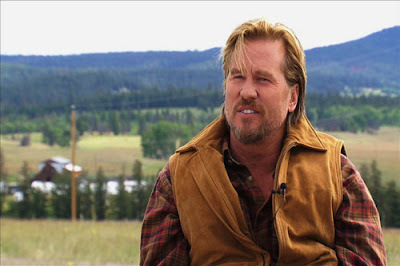 I read what you had to say, and it was awesome, but the Val Kilmer factor means I'm totally watching this one. Haaha I warn you he is not in most of it!! Val is a really good actor and I thought he did a good job in this; it's a shame he got a reputation for being difficult and his career never really blew up like others. And Real Genius is just a classic! I actually watched this for Kyle Schmid (who I also thought did a good job given that his role was limited) and it's channeling of The Thing. It actually wasn't as cringeworthy as I thought it would be, though they were a bit heavy-handed with he evtl theme. Not a bad movie, though, but nowhere close to The Thing! Bring back Knight Rider so we can hear Val Kilmer reprise his role as KITT. I demand it! I saw this too and was like global warming causes bugs to eat people? Hey Al Gore, you didn't tell me that was gonna happen.